Chanel Jeux de Regards makeup collection finally launched in the US (available at Nordstrom stores and online). The collection concentrates on the eyes, of course, and the products featured are mostly repromotes except for the 2 new eyeshadow quads and an eyeliner. I have never been a fan of the Illusion D'Ombre formula and have enough eyeliners to last me a lifetime and some more, so I picked up only the eyeshadow quads. I do have some photos of the other products to share, though. Light bluish green, pale greyish sliver, dark grey with hints of bluish green, medium grey. I have swatched the light blue green shade twice - the first and last swatch - since the first one isn't very clear. Chanel Seduction Eyeshadow Quad used in THIS tutorial/FOTD. Apparition, Convoitise, Bleu Exquis are supposedly new launches, but Apparition was available for a while on the Chanel website as part of the Bleu Illusion collection. 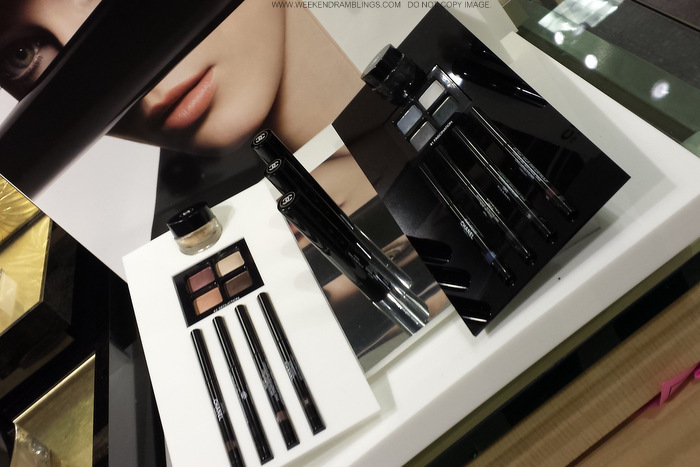 Chanel Jeux de Regards Makeup Collection (display at Nordstrom). I love the powder versions of the Chanel eyeshadow quads that folks in the US are lucky to get. I had planned to pick up only Seduction, but I just couldn't resist the muted greyish blue-greens of Fascination so ended up buying both. The colors seem (because really I haven't done anything more than swatching once or twice) so smooth and pigmented. For my swatches, I applied the shadows dry with no primer or moisturizer on my hand. At the counter I had used the Chanel eyeshadow brush to apply them, and I got pretty good color payoff. The more I see these, the more I am oh-so-not-amused by Chanel's marketing strategy - selling stupid baked versions in other parts of the world. Sure, some of the newer baked versions are quite good, but I prefer these any day. So jealous!!! I pre-ordered these from Nordstrom like 3 weeks ago and have been waiting and waiting. I should have them in a few days--you're so lucky to have them already. I can't wait to play. I usually don't do blues either, but Fascination just looked too incredible too pass up. Aww...well at least Nordstrom has free shipping! I saw this display at Bluemercury in DC. I couldn't leave without buying Convoitise and the Santal eye pencil. 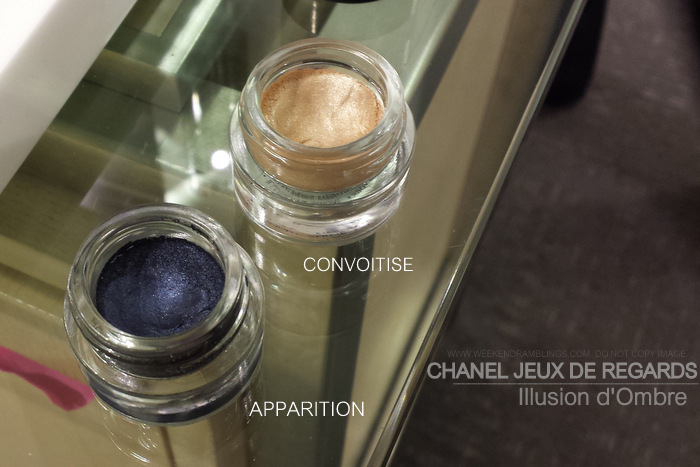 I was surprised to see Apparition, a re-release from a LE collection Chanel put out a year ago. I bought it then and love it. Just saw these at the Chanel counter and managed to resist purchasing the blue quad. After seeing the swatches I'm really tempted to go back and get it! The Fascination quad looks very familiar, do you know if the colours have appeared in other Chanel quads before? Thanks for posting. Bleu Exquisis might be just what I need! Hmm..I thought it looked similar to the Metamorphose quad, but it isn't..other than that I don't have anything else similar..
Seduction reminds me of Eclosion, which I have but really dislike. I shall skip the blue; partly due to your eye look I have decided that Nars Kamchatka will be the only blue eyeshadow I buy. I think ;).